NEXCOM 10.4-inch vehicle mount computer VMC 3020 increases inventory control, visibility, and accuracy to optimize warehouse management. 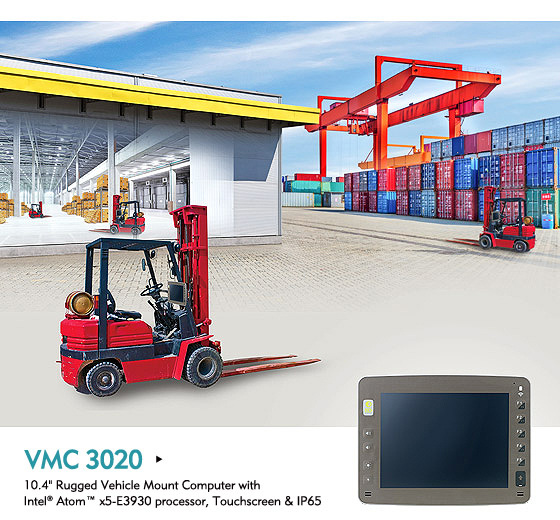 Designed for use on forklifts, the VMC 3020 is geared with Intel® Atom™ x5-E3930 processor, real-time communications, easy function integration, and high availability and reliability for fast-paced, high-intensity warehouse environments. By streamlining live dispatch, order processing, and driver and asset management, the VMC 3020 can help manage the dynamics of complex workflows in warehouses, distribution and fulfillment centers, and ports and harbors. To improve accuracy and efficiency of warehousing activities, NEXCOM VMC 3020 features Intel® Atom™ x5-E3930 processor, a 10.4-inch touchscreen, wireless connectivity, and voice communications. The vehicle mount computer can check the latest work orders, navigate through storage racks, and update real-time stock levels to a warehouse management system (WMS). The VMC 3020 also enables forklift operators to speak to supervisors for clarification of obscure instructions. With the VMC 3020, incoming and outgoing pallets of products can be handled accurately and tracked closely throughout the warehouse operations. To complement the needs for supply chain traceability, the VMC 3020 allows easy function integration by powering connected peripherals, such as scanners and printers, with up to 12 output voltage. As to driver and asset management, the built-in iButton and RFID interfaces are intended for driver authentication, theft prevention, and monitoring the compliance of Hour of Service (HoS), while the CAN bus is provided to harvest telematics data to expedite the adoption of driver behavior monitoring and preventive maintenance and to spur the shift to warehouse outsourcing, forklift leasing, among other Anything-as-a-Service (XaaS) business models. The VMC 3020 delivers high levels of availability and reliability across different work environments. The vehicle mount computer has a wide temperature range from -30°C to 60°C and comes with an optional heater for use in freezing temperatures of cold storage warehouses. For outdoor applications, the IP65-rated anti-glare VMC 3020 is water-resistant and dustproof and can give a clear view in bright sunlight. Additionally, the VMC 3020 supports 9V to 60V power input to be used with different forklift battery voltages, and an battery pack is available as an option to ensure uninterrupted data processing and for after-hours system updates when forklifts are powered off.